316L Applications: Wood, pellet, gas, oil, and coal burning appliances. 316L Rigid Liner has greater corrosion resistance than 304L Rigid Liner. Our 316L rigid liner and components are fabricated from the highest quality stainless steel, laser welded seam for a perfectly round pipe, and UL listed in the US and Canada. No more lock form seams, or spot welds that are leaky and dangerous enough to be illegal in Europe! One of the great features about our rigid chimney liners is the seam and how it keeps the pipe perfectly round. Lock and spot welded seams warp, ours will not. Our seams are laser welded, leaving virtually no seam to be seen. Our stainless steel flue pipe sections slide together for a tight fit, the first time, every time (use our rivets for an easy install & tight fit!). Watch our helpful videos: Rigid Chimney Liner Top Kit Installation and Rigid Chimney Liner Product Overview. 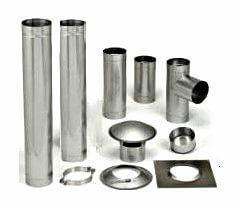 Use 316L stainless steel rigid flue pipe for wood, pellet, gas, oil, or corn burning appliances. Best used for straight chimneys without any offsets, when you'd like to extend the pipe above the chimney top for added height, and would like to increase draft. Our rigid flue pipe is easy to clean, heavy duty, and increases your draft due to it's smooth interior. In case you have offsets or a very tall chimney, our stainless steel Rock-Flex liner is an ideal alternative. If you are burning solely wood or wood pellets, the 304L stainless steel rigid liner is also available. APPLICATIONS: Wood, pellet, gas, oil, and coal burning appliances. 316L Rigid Liner has greater corrosion resistance than 304L liner. Rock Rigid stainless steel 316L chimney liner pipe has the industry's only laser welded seam; won't warp like others will over time. Use for wood, pellet, gas, oil, and coal burning appliances. Compress the insulation around the rigid liner by hand, until the two edges snap and lock together. Available in 24" lengths. Rigid insulation increases the outside diameter of the liner pipe by 1.75". Rockford is well known for the quality of its chimney flue caps and that is important because, after all of your hard work the cap is all you will see ground level! 22 gauge stainless steel rain cap with wind guard. Used to adjust desired height of rigid liner stove pipe. Our rigid telescoping sections eliminate time consuming cutting and crimping and easily adjust for a prefect fit. Great to have for your installation. The Rigid Flat Top Plate fits flush to the chimney top and features a sloped top for increased water runoff. Use the flat top plate if you do not have terra-cotta tile projecting above the chimney crown. The Rigid Terra-Cotta Mount Top Plate is used if you have clay tile in your chimney and it's exposed by 1/2” or more at the top of your chimney. Made with stainless steel. The Rigid Flat Top Plate fits flush to the chimney top. Use the flat top plate if you do not have terra-cotta tile projecting above the chimney crown. Made with stainless steel. The 18 gauge stainless steel support clamp is installed around the liner, and sets on top of the top plate which supports the liner at the top of your chimney. Install the stainless steel storm collar around the rigid liner right above the support clamp to keep moisture from entering the flue liner or the chimney cavity. The stainless steel is guaranteed not to rust! 316L Stainless Steel Rigid Liner Tee, with removable 10 in. horizontal snout, and bottom clean out cap. Laser welded seams ensure a perfect round and sealed fit to our rigid liner pipe. 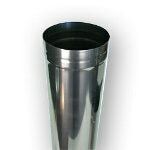 316L Stainless Steel Rigid Liner Tee, with removable 22 in. horizontal snout, and bottom clean out cap. Laser welded seams ensure a perfect round and sealed fit to our rigid liner pipe. The Tee Extension Slip Connector's male end slips inside the snout of our tee. It allows you to add 8 to 16 inches simply by sliding it in or pulling it out of the tee snout. Our stainless steel elbows have laser welded seams for smooth adjusting. These elbows have a female end to accept rigid or black pipe and a male end to complete the connection. No adapter needed! Are you in a tight spot? For tight clearance relining situations, this male to male chimney liner connector is just the ticket! This component will require screws or rivets. Stainless steel 1/8" diameter pop rivets with a grip range of 1/8". These rivets are great to have on hand when working with our rigid chimney liner. Pack of 100. You may also need a Pop Rivet Gun Kit. The diagram at left shows the parts typically needed at the top of the chimney. The rigid liner Rigid Chimney Liner Pipe (1) is inserted into the chimney. The chimney top is covered by the top plate Rigid Liner Flat Top Plate— or — Rigid Liner Terra Cotta Top Plate (2) which goes on over the liner. A support clamp Rigid Liner Support Clamp (3) holds the liner in place and keeps it from slipping down the chimney. The storm collar Rigid Liner Storm Collar (4) covers the gap between the liner and top plate to keep out moisture. The rain cap Rigid Liner Rain Cap (5) gives an attractive finished look while keeping rain, birds and critters from getting into your chimney, and sparks from getting out. If you are connecting to an existing fireplace without an insert, you will need an additional top plate Rigid Liner Flat Top Plate to use where the bottom of the liner reaches the fireplace opening. You may also need to fill the space around the liner with insulation mix Pour-Down Chimney Insulation Mix. If your fireplace has an insert with a top opening, you may need an elbow connector Adjustable and Fixed Elbows for Rigid Liner. Rigid Liner Tee with 22 in. removable snout and clean-out cap. rigid adjustable elbows Adjustable Elbows for Rigid Liner to change the angle of the liner, and pop rivets Pop Rivets for assembly.